Traditional invoice financing is based on a financier purchasing invoices from the seller. In return, the financier agrees to advance monies to the seller against each invoice. The buyer who purchased the seller’s products must pay the invoices directly to the financies. 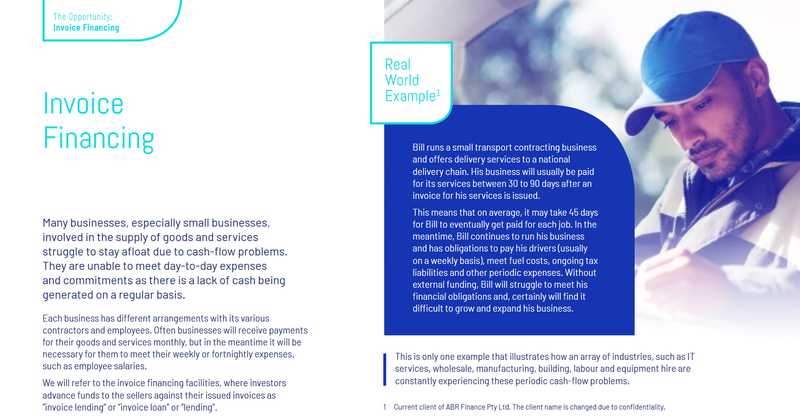 What is the key issue with traditional Invoice Financing? The key issue with traditional invoice financing is that the financier purchasing an invoice from the seller and advancing the funds against it does not have a direct relationship with the buyer. The financier solely trusts the information provided by the seller. As a result, the relationship between the seller and the buyer is not completely transparent to the financier, and therefore exposes the financier to a considerable risk of the invoice not being paid as agreed or disputed. The Invox Finance Platform is a decentralised peer-to-peer nvoice lending platform that will allow sellers, buyers, investors and other service providers to directly connect, interact, share and distribute information. The platform aims to create a trusting environment by facilitating transparency between parties and rewarding performance. This platform will disrupt and revolutionise traditional invoice financing by implementing a system where trust and transparency between all parties is developed through an in-built reward system. n addition, the execution of transactions and flow of information will not be dependent on one single centralised service provider, but instead governed by a transparent set of rules executed on a fully distributed ledger. The financier will usually approve the business for this facility based on the financial strength of its customers (i.e. to whom the business supplies and issues invoices). Should the customer dispute a payment or fail to pay an invoice, the liability will fall on the seller. From the financier’s point of view, the invoices are its only security. Customer disputes, non-payment of invoices and fraud reduce the integrity of these invoices. To address these issues, financiers have processes and procedures in place to assess each debtor, verify invoices, obtain proof of delivery and confirm payment liability. These processes are time-consuming and require substantial manpower. To further mitigate its risk, the financier will also seek services of external parties such as credit checking agencies, debtor insurers, lawyers and debt collectors. This option will usually fix the cash-flow problem but can be expensive as the fees charged by the financier are usually very high. This is because invoice financing fees will usually have two components: an interest rate charged on the outstanding monies (this is typically between 1.5% and 3% above the London Interbank Offered Rate (LIBOR)) and a service fee, which is typically between 1.6% and 3% of the seller’s annual turnover. For example, if a Seller has $100,000 outstanding on average over a period of 12 months with an annual turnover of $1,000,000, the total effective annual rate paid to the financier can be between $8,000 and $34,500, or 8% per annum up to approximately 34.5% per annum. Typically, the annual percentage rates paid by small businesses will be at the higher end of the above range, that is, between 25% and 34.5%. Financiers can also charge a number of other fees, such as late payment fees and overfunding fee, which can further increase the effective interest rate paid by the seller to the financier. Invoice financing can be the best short-term funding solution, provided that it is used only when the funds are required to smooth periodic cash-flow bumps. Access: Governing access and the use of the Invox Finance Platform. That is, govern the terms and conditions of the use of the system by each user (i.e. the seller, investor, buyer and any third party service provider). Legal: Govern general legal terms and conditions of the relationship, financial terms and conditions and the flow of funds between the seller, the investor, and the buyer, and the settlement of invoices. Interaction: Govern the interaction between various parts of the Invox Finance Platform. Namely, the interaction between Dynamic Invoice Smart Contracts, the Loans Smart Contracts and the User Access and Processing Hub. Tokens to be used seamlessly inside the platform with sufficient liquidity. Transparency: Any interested party, which has permission, can view the terms of the transaction on the blockchain ledger. Reduced fraud risk: Smart Contracts, together with invoice verifications, reduce the risk of fraud and manipulation by any one party – Smart Contracts exist on the distributed ledger and therefore cannot be manipulated or interfered with by a single party. Reduced counterparty risk: Once the transaction is established between the parties and deployed on the blockchain, the execution of the terms of the smart contract cannot be stopped, interfered with or manipulated. Decentralised: Smart Contracts eliminate the risk of trusting the centralised service provider to maintain the integrity of the transaction. The service provider does not have any direct involvement in managing the execution of the terms of the smart contract or the flow of funds between parties. No, the user interface on the Invox Finance Platform will create a seamless user experience. In particular, the user interface will allow for all payments to be made in fiat currencies by utilising our banking partners’ API. What is an Invox Token? Invox Tokens will be created on the Ethereum network using the ERC-20 standard and will have the following utility: provide access to the platform through the Trusted Member Program; and reward work performed for the platform. That is, the system will reward buyers and sellers with Invox Tokens for invoice verification, payment of invoices and settlement. The Trusted Member program incentivises sellers to hold more Invox Tokens by allowing access to higher levels of invoice financing. 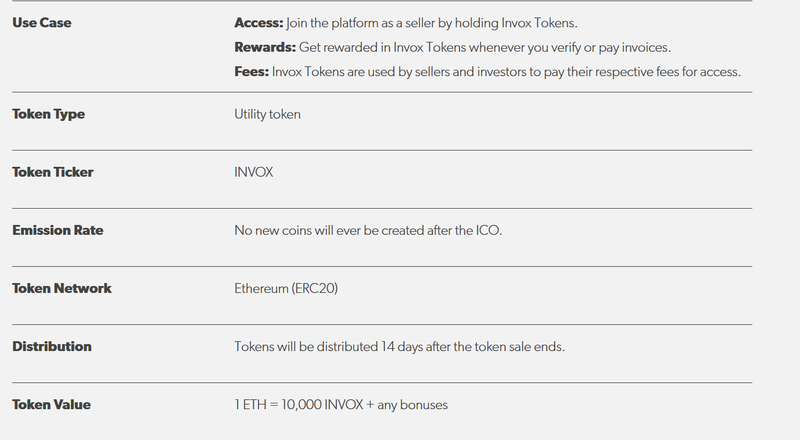 Buyers and Investors will not be required to hold any Invox tokens. We are raising funds to develop the system, market the service and build a community. The founding team will have invested over $500,000 AUD in cash at the completion of the ICO. Invox Finance intends to offer Invox Tokens to institutional and retail investors to help fund the evolution of invoice financing. 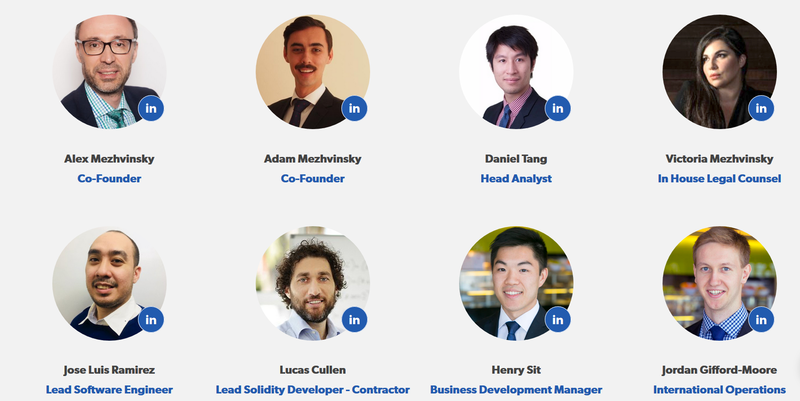 You can also get involved by joining the Invox Finance community and participate in bounty programs. Invox Tokens will entitle its holders to access the Invox Finance Platform through the Trusted Member Program. By participating in the Invox Finance two stage ICO, you will be provided with the opportunity to acquire Invox Tokens at a discount. The ICO is being run in two parts with a bonus system rewarding participants in the pre-ICO as well as during the ICO itself. For more information visit www.invoxfinance.io.